These patterns are more results of my recent exploration of medieval and renaissance textile motifs. The pomegranate is the symbol of Spain, and a crowned pomegranate was the personal badge of Catherine of Aragon. Pomegranates show up on all sorts of period textiles, including cut velvets, looped velvets, and silk; similar patterns can be traced back to ancient Indian and Persian sources. 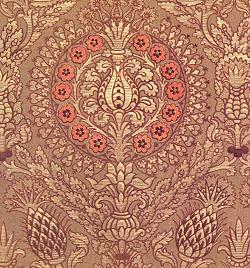 See a typical sixteenth-century silk pattern with pomegranates and thistles. This is a wide but delicate border. This border is narrow and dense. Notice the fill variations for the "seeds" and the leaves. Pick one for your pattern, mix them up, or make up your own! This design combines motifs from both of the border patterns. It would work well as a wide border or as an overall pattern (join several rows together). This is the first pomegranate pattern I designed. It owes more to a plant in my mother's garden than to formal sixteenth century designs. All patterns, text, and illustrations are copyright 1985-1998 Paula Katherine Marmor.